It’s the triumphant return of one of our original co-hosts, “Big Show” Matt Schafer. Instantly, Big Show takes Brian and Melissa to task for our social media following before admitting to skipping out on the “Milk Challenge” owed to our listeners after accumulating 100 Twitter followers. We go down memory lane recalling some of our past mistakes and the high production values that are a hallmark of The Unadulterated BS Podcast. “Big Show,” enjoying the trip down memory lane, brings up past sponsors. The list is short. Stories of Brian and Melissa’s wedding take over, including a promise to send out thank you cards. This starts “Big Show” on a rant against cards of all types. Hallmark, beware. 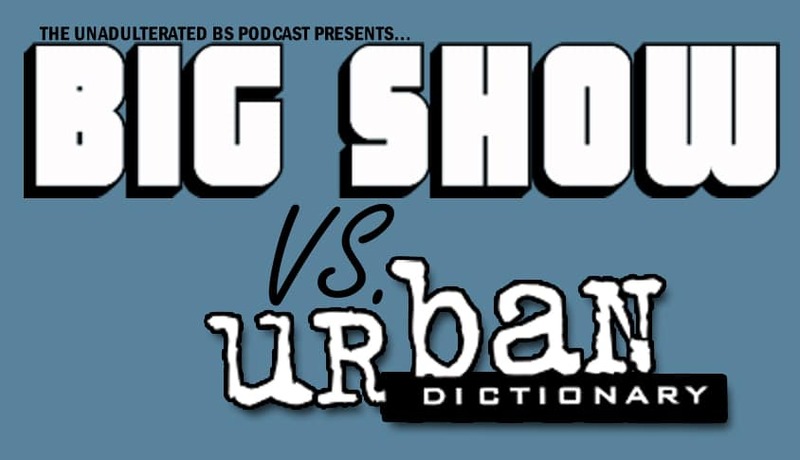 With The Big Show’s return, we bring back the original version of our Urban Dictionary game show, Big Show vs. The Urban Dictionary. In the original version of our game, we ask “Big Show” to provide his best guess at the definition based on the word or phrase provided. Here are the words for our game on this episode. Melissa’s not going to do the milk challenge. It’s not happening. For “Big Show,” that’s all until 2022. That wraps up our trip down memory lane! With only seven episodes to go until our 150th episode, look for some more throwback co-hosts in the coming weeks as we run up to our milestone episode. “Tell Me What I Want” by Isolated Atoms is licensed under an Attribution 2.0 UK: England License.